How to get people to adopt new software: Help them make sense of it. I had an expansive coffee earlier this week with Kai Riemer, who is a senior lecturer at the University of Sydney. Kai is a super-smart guy, who has done a lot of research into why people use Yammer and other various forms of social media in their work and lives. Kai has just recently published a new report, titled Oh SNEP! The paper outlines a new model which helps explain how and why people begin using social media in their organisation. Check out Kai’s great post on the topic for the full story. One key thing Kai outlined to me over the coffee we shared is that people chose how they use a tool and they do this by making sense of it for themselves. Here are a few gems I’ve taken away from our conversation. Imagine an archeologist working on a site and discovering a tool of some sort. The archeologist can assess the tool, describe it’s various features and understand what it’s made of. It might, for example, be wooden with metal spikes and have all the features of a modern day hair-comb. But we can never actually know what people used the tool for. We can guess, but we can never know. All we do know, is that this tool probably made a lot of sense to the people that once used it. New technologies are very similar. It’s no different today. People will use a new tool because it’s interesting to them. Perhaps a friend or a colleague shared it with them and they’ve decided to take a look at it. Once they take a look at it, they’re confronted by a new thing to understand. The first thing that people do when faced with this is try to make sense of what it is they’re seeing. They will work to understand how this tool can help them. What can I use it for? What utility will I get from this? Everybody is the same. Everybody. Whether you’re a social media guru or a self-proclaimed luddite. People might have a lower threshold for new technology or change, but they still must fundamentally make sense of said change before becoming productive. And here inlies the key point. You can’t make sense of a new thing for anybody. Only they are able to make sense of it for themselves. You can help them on that journey, certainly. But unless they can make sense of it, they will not continue to adopt the new technology beyond that initial sense-making stage. And so they will not become productive using it. This makes intuitive sense. Think about the last time you showed someone how to use Twitter. Twitter is very hard to make sense of for the general punter. What is a follower? How come I don’t see anything when I log in for the first time? WHO do I follow? How do I send something to them? What is a mention? Why is everybody’s name spelt with an ‘@’? It’s a very foreign experience for many people. 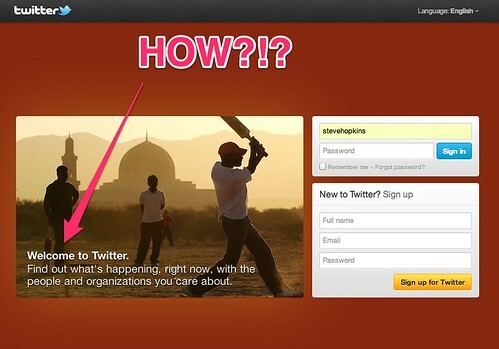 If you’ve forgotten what that’s like, try explaining Twitter and how to use it to your Dad, Mum or someone else. You’ll see what I mean. Now think about email. You have an inbox, just like your snail mail letterbox. You receive letters (electronically). You can send letters (electronically). Everybody has an address. You just need to get their address, and you can send them a letter. That’s pretty much it. It mimics real life mail and so is very easy to understand. It is easy to make sense of. I’m going to keep exploring this idea myself. It makes sense to do so! Thanks Kai for your time the other day. I’m looking forward to the next installment. Next Post Happy 3rd birthday @square! 1) While it is true that everyone has to make sense of a new technology, this is at the same time a social process! In particular so in social media. With Yammer this is about figuring out together what it can do for you in a social context such as a work practice, and thus what it will become. Work practices can be quite different and so Yammer can become quite different things in different contexts. Which makes our research so exciting! 2) Sense making always happens against the background of what you already know and the norms, habits, ways of working of the work practice. But this is a complex process (which we want to understand better in our research). Take Yammer as an example: If someone is already familiar with Twitter, one might argue, ‘ this will make it easier as they already know what to do with Yammer, how to post and how the whole following thing works, so adoption should be easier.’ Probably right. But at the same time it might hinder adoption, as people might say, ‘ah this Yammer thing is just like Twitter. Twitter is just chatter, people going on about themselves etc., we don’t need this here’. This shows that there are several processes at work: learning, interpretation, imagining the new thing in one’s own context, discussing what it could become, sharing good practice etc. All of this we found in our SNEP study. Ultimately, our aim is to move away from a simplistic view that sees adoption as a user decision to developing a theory that is true to what actually happens. More to come! Looking forward to more talks and collaboration. Great comment Kai. I’m very much looking forward to the next collaboration too. Kai – have you explored much further about other people in the social media space. In my work I have found that some people look to engage on a social media platform for a specific reason, but find that what or who they are looking for isn’t there. For example: 18 months ago I was advising early childhood practitioners on the use of digital and social media and the process of exploring Twitter at the time demonstrated that there was little value in investing time getting to know twitter for the purpose of connecting and sharing with other early childhood practitioners – because no one was there. Now there are several hashtags and chats and somehow enough people in that area began to engage and it has become a worthwhile space. I’d only chime in and say that ‘sense’ is very much in the eye of the person using the software. This is one other key theme I picked up from the report and our chat. It doesn’t matter how I make sense of things, each person must make sense of the tool in their own way. In your example above, Twitter didn’t make sense because there was no perceived value in doing so. There may have been hashtags and chats, but the user didn’t resonate with those functions and so the tool didn’t fit the task at hand. Hi Dan – Sense making in the way we are describing it is a very practical activity actually, it is not primarily cognitive, as in staring at the thing and imagining what you could do with it. Rather it is taking baby steps, getting started, experimenting and trying things out. This is how organisational (team, group) adoption will gradually move to the all important critical mass tipping point. All of this is embedded in discussing, sharing of ideas and ‘use cases’. Safe-to-fail experiments is a good way of putting it – so just getting started, I presume (which incidentally might be the hardest bit). Hacking the common condition would seem to be the process of being aware of that condition – correct? Definitely a prerequisite and major step. What are the fundamentals and how do they express? This, amongst other things such as the mavericks and makers combined with (hyper) mimesis lead to adoption.